Our senior girls in their lovely new leotards. Check out our video of Aladdin and Cinderella. 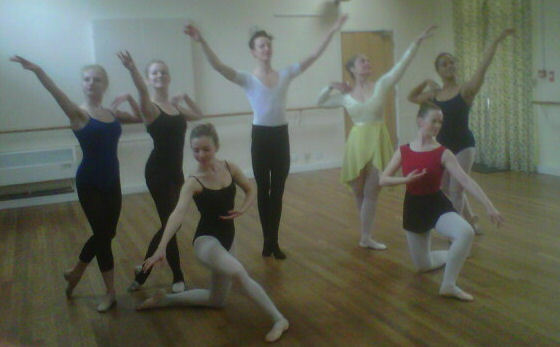 West Berks Ballet School helped raise a HUGE £175.20 for Comic Relief! Fantastic! Jane's article for The Oaks. Aamina Morbi and Chloe Brown were asked to go to London to demonstrate the Grade 4 work before a gathering of Cecchetti examiners. Tegan looking good after her week of summer school with Royal Ballet & Elmhurst students in the top ballet class! Well done Tegan. I am very pleased to tell you that we have already raised £176 for Macmillan Cancer Care from the Nutcracker photographs you ordered. Thank you very much. were chosen to demonstrate in a final teaching assessment. WBBS teachers got together for a party to celebrate Christmas. We are once again off the London to the Ballet. Here are four of our Grade 1 girls in their new school hoodies. 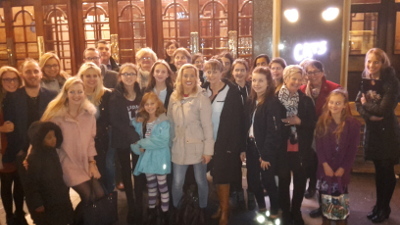 This year WBBS sent 4 students to the annual Cecchetti Mabel Ryan competition in London. Our performance of Cinderella and Aladdin at Trinity was a great success. Samuel Butler has been offered a place at Laine Theatre Arts for October 2008. Here we all (well some of us - too many to fit in the picture) are with Claire's friend Anna Woodside who was Demeter in the show! Lots of us got her autograph. And we all loved the show!